Objectives To investigate the effect of intravenously administered (IV) Golimumab (2 mg/kg), an anti-TNFα monoclonal antibody, on sleep problems, total back pain, and night back pain in adult patients (pts) with active Ankylosing Spondylitis (AS). Methods GO-ALIVE is a Phase 3, multicenter, randomized, double-blind, placebo-controlled trial. Pts (aged ≥18 years) had a diagnosis of definite AS (per modified New York criteria) and BASDAI ≥4, total back pain visual analogue scale (VAS) ≥4, and CRP ≥0.3mg/dL. At baseline, 208 pts were randomized to IV golimumab 2mg/kg (N=105) at Wks 0, 4, and every 8 wks or placebo (N=103) at Wks 0, 4, and 12, with crossover to IV golimumab at Wk 16 and through Wk 52. Sleep problems were assessed using the Medical Outcomes Study Sleep Scale (MOS-SS, range 0–100), a generic instrument designed to assess six dimensions of sleep, including 1) Sleep disturbance, 2) Somnolence, 3) Sleep adequacy, 4) Snoring, 5) Awaken short of breath or headache, and 6) Quantity of sleep/optimal sleep during the past 4 wks. The six dimensions are also used to generate the composite Sleep Problems Index. An increase in score from baseline represents improvement. Total back pain and night back pain over the past wk were assessed using VAS (0–10 cm; 0=no pain, 10=most severe pain). Wk 28 results are presented here. Unadjusted p-values of least square mean differences (LSMD) between treatment groups were based on analysis of covariance (ANCOVA) controlling for prior anti-TNF therapy. Results Mean changes in MOS-SS Sleep Index and 6 subscales are presented in Table 1. 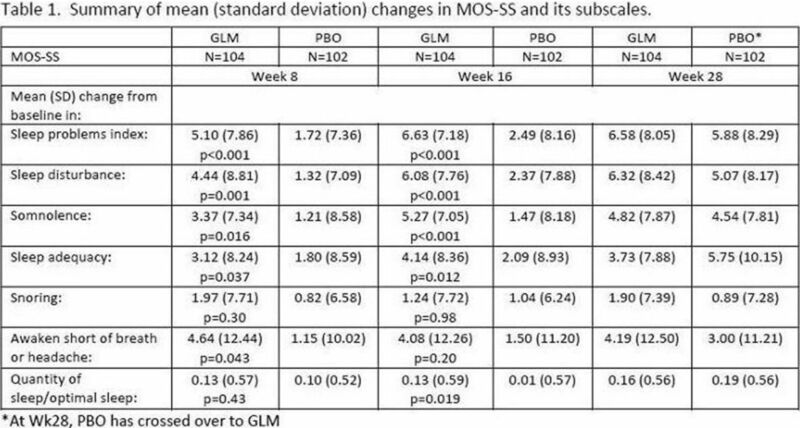 Improvement (p<0.05) in the MOS-SS sleep index and 4 subscales at Wk 8 was observed in golimumab compared to placebo, and in the sleep index and 4 subscales at Wk 16. Improvements from baseline to Wks 8 and 16 in pts' assessment of total back pain (cm) were greater (p<0.001) in golimumab than placebo (-2.70 vs -0.86 and -3.15 vs -1.15, respectively), and after placebo crossed over to golimumab, the differences diminished at Wk 28 (-3.14 vs -3.34, respectively). Improvements at Wks 8 and 16 from baseline in pts' assessment of night back pain (cm) were also greater (p<0.001) in golimumab than placebo (-3.03 vs -0.87 and -3.44 vs -0.85, respectively), and differences diminished at Wk 28 (-3.47 vs -3.42, respectively). Changes from baseline in all subscales of MOS-SS were correlated (Spearman correlations ranging between -0.10 and -0.45) with total back pain (TBP) and night back pain (NBP) at Wks 8, 16, and 28 (p values <0.05), with the exception of Snoring and both TBP and NBP at Wk 16. Change in NBP was associated with change in Sleep Problem Index at all 3 time points (p=0.002, p=0.001, and p=0.031, respectively). In the general linear model, most of the association between change in TBP and change in Sleep Problem Index was explained by the association between change in NBP and change in Sleep Problem Index. Conclusions Adult pts with active AS treated with IV golimumab showed improvements in sleep problems, total back pain, and night back pain. Night back pain improvement was associated with improvement in sleep problems.